Home > VR > E3 2017: Moss was a real highlight of Sony's show... but why is it a VR game? E3 2017: Moss was a real highlight of Sony's show... but why is it a VR game? 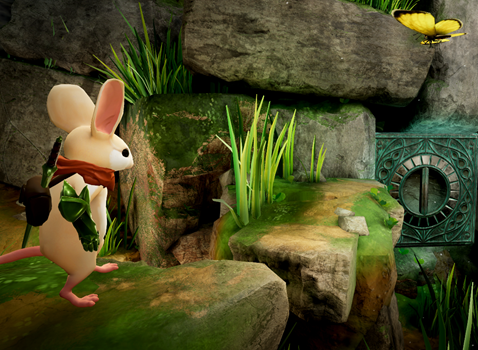 Of all the games that Sony showed off at its E3 conference this year, the most fundamentally interesting one must have been Moss, a game about a mouse that is being developed by Seattle, USA-based developer, Polyarc. As an introduction to the adventure we are provided with a fairy tale-like book, which makes sense given that Moss' protagonist, Quill, walks around on two legs and carries a sword with him. This mouse is a hero mouse, see, and he'll face what we're told are "compelling characters, gripping combat, and challenging puzzles" on his quest. What's odd about the game is that it doesn't seem to leverage the PlayStation VR's technology in any meaningful way. As a third person adventure game, it's hard to imagine what players will be doing with the VR perspective that can't be done using a conventional screen, and there was no indication on how VR will interact with the game in the trailer. Now, it might be that the development team couldn't think of a way to represent a VR experience when representing the game in two dimensions (and fair enough, it is hard to sell VR with 2D vision), but it left the DDNet team a little confused as to why it's being promoted as a VR game at all. “We are designing Moss with the fundamentals that we know make a great action-adventure game while at the same time considering every decision with the unique strengths and opportunities VR offers fully in mind,” said Tam Armstrong, co-founder and CEO of Polyarc. “As a studio dedicated to the new medium of VR, our goal is still the dream we’ve always had as game developers—to create engaging worlds and share them with everyone." If nothing else, we're always up for more super cute games starring super cute characters, so colour us keen on Moss indeed.